Japanese Prime Minister Shinzo Abe and leaders of some other major U.S. allies are worried about the possible policy of “no first use” of nuclear weapons being considered by the Obama administration. The fear is that such a policy would weaken the ability to deter aggressive dictatorships such as North Korea. South Korea, France and Britain are also said to have privately communicated their concerns to U.S. officials about a potential declaration by President Obama of such a policy. If Mr. Obama were to declare a no-first-use policy, it would represent a major change in the U.S. nuclear posture. To read a Japan Times story on this topic, please hit this link. Japanese Prime Minister Shinzo Abe has ordered Economic Revitalization Minister Nobuteru Ishihara to draft a range of economic measures to end deflation and raise Japan’s growth potential. The program will include a supplementary fiscal 2016 budget. The government will submit the fiscal 2016 budget draft to a special session of parliament this fall, Mr. Ishihara told a news conference on July 12. For The Japan Times’s article on this, please hit this link. As Chinese expansionism fuels fears all over East Asia, Japan plans to buy new fighter jets worth a total as much as $40 billion. Japan is increasingly worried about Chinese aggression in the East China Sea, where there are a number of islands whose ownership the two nations dispute. It’s also worried about Chinese militarization of the South China Sea, which could threaten freedom of navigation in some of the world’s most important shipping lanes. Japan seeks a kind of warplane that will let it maintain air superiority over China. China’s warplanes still lag behind those used by the U.S. and its allies, but Beijing has been building its capability, fueling a more muscular security agenda under Japanese Prime Minister Shinzo Abe. Japanese Prime Minister Shinzo Abe, who just finished hosting the G7 summit, plans to propose a fiscal stimulus package of as much as $90.7 billion after warning G7 leaders that the global economy faces a significant risk of another crisis like that in 2008. Many observers, however, think that his fears are exaggerated. The proposed stimulus will include accelerating the construction of a magnetic-levitation train line from Nagoya to Osaka, issuing vouchers to boost consumer spending, increasing pay for child-care workers and setting up a scholarship fund. Hit this link. 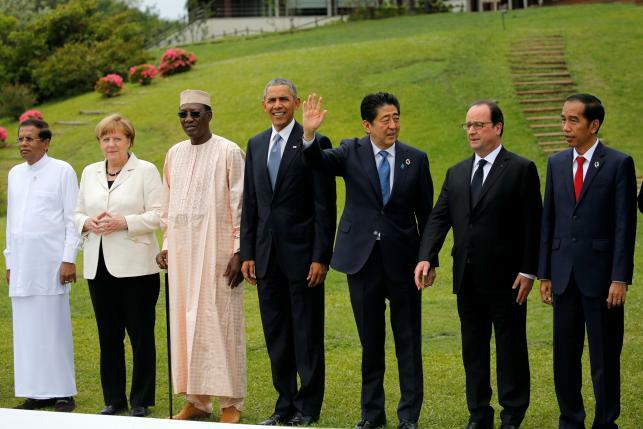 (May 30th, 2016) G7 Summit host Shinzo Abe, the Japanese prime minister, said he and the other leaders of the most important industrialized democracies share a strong “sense of crisis’’ about the global economic outlook. G7 leaders wrapped up a summit in central Japan by, among other statements, vowing to use “all policy tools” to boost demand and ease supply constraints. Mr. Abe referred to current parallels to the global financial crisis that followed the 2008 Lehman Brothers collapse.